The pipeline is the heartbeat of an organization, but it’s the lifeblood of a sales rep. It’s the fuel for hitting quota and making money. Sales Teams: Are You Listening AND Understanding? Listening to buyers is the biggest area of opportunity for businesses to gain trust from their buyers. The most frequent reason organization’s lose business, as stated by their buyers, is they did not fully understand the buyer’s needs. 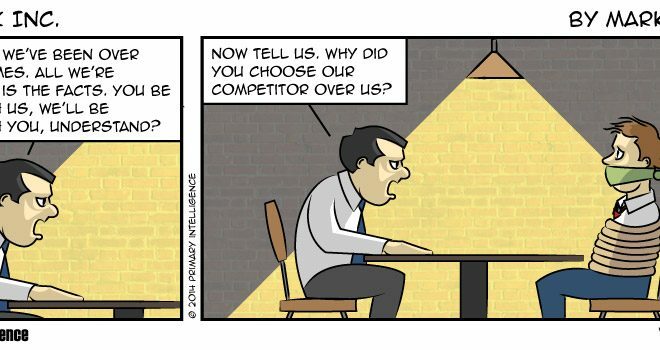 When Competitive Price Discounting Becomes Your Company’s Biggest Weakness! The company’s strategies were not working. In fact, the majority of their loss deals, the buyer had a budget that was OVER the total cost proposed, and they ended up spending more money with the competitor. So why were they losing on price? Executive buyers appreciate sellers that focus on business outcomes, help understand the barriers to achieving them and articulate the relevant capabilities that can be used to address them. Once compelling value has been established, buyers are incentive to accelerate the decision process as they realize delays mean benefits are not being realized. Despite both active and passive resistance from some sales teams, most organizations are using Win Loss data to assist their sales representatives. Primary Intelligence asked Win Loss practitioners for their advice to companies who are just starting out on their Win Loss journeys. This blog post shares a summary of these experts’ best and brightest ideas. As buyer loyalty in the B2B industry has changed, building trust has become increasingly important. Instead of reliably buying from the same, single vendor year after year, B2B managers now look for the best value and the highest performance to solve their company’s needs. In blissful ignorance the client would have missed a key component and enforced policies around training the sales team on how to properly present and the solution team on attention to detail in the requirements. A lot of wasted time and effort on both the stakeholder’s and team’s side. You need your customers to participate. Being coy about those expectations may earn you the first contract, but it certainly won’t earn you recurring business. While it’s illegal to steal other company’s trade secrets, it’s fair game to ask buyers for their feedback about products, service, support, and sales effectiveness. One of the gems Tamara left us with is the importance of getting assumptions about who important buyers are out of people’s heads and onto the table, a process she likened to “teasing the hairball” out of our minds.